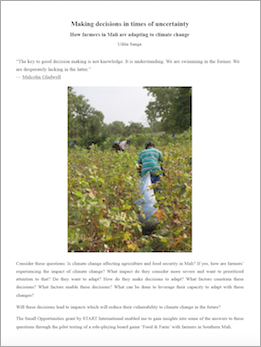 How is climate change affecting agriculture and food security in Mali? How do farmers react and adapt to climate change? Understanding the context, the decisions, and the actions that make communities less vulnerable to climate change is key to promoting long-term, effective solutions. As part of the Adaptation at Scale in Semi-Arid Regions (ASSAR) program and with a Small Opportunities Grant from START, Udita Sanga was able to gain precious insights into the complex dynamics of how farmers are adapting to climate change in Southern Mali.